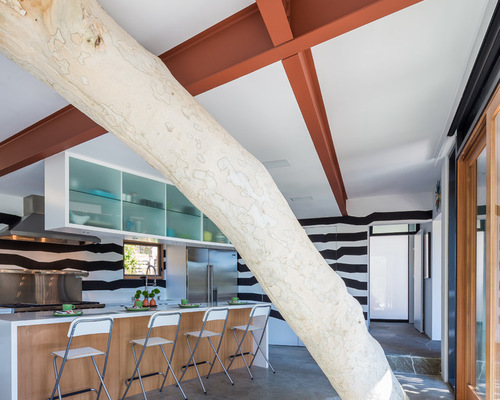 This article was originally published on Houzz on May 27, 2016, as "How to Use Trees Inside," and is presented here with permission. Read the original article. Trees are nature’s perfect architecture. Besides being beautiful, they provide shade and shelter, and change with the seasons. Hanging out in treehouses in childhood was perhaps our way of getting close to these perfect living structures. Lucky for us, we can keep trees close to home even as grown-ups. 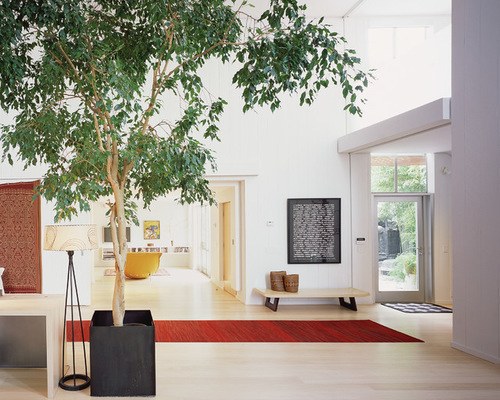 It’s possible to bring trees indoors as integrated design elements, either by using existing mature trees or with new plantings. Here’s what to consider whichever way you choose. The first way of integrating trees into the design of the home is by designing new construction around existing mature trees. A licensed building architect is the professional who ultimately creates a tree-focused home design, but the architect may consult with a certified arborist, landscape architect or landscape contractor to ensure that the trees are healthy and not damaged during construction. Protecting existing trees and integrating them into the building of a new structure is a collaborative effort among the homeowner, architect, contractor and tree experts. Photo by ANX/Aaron Neubert Architects; original photo on Houzz. First, evaluate. Some species of trees are simply less sensitive, and more resilient to stresses and changes in their environments. One such tree is the California sycamore (Platanusracemosa), shown here as a mature specimen that has been partially enclosed by new construction. Whether or not a specific tree can be safely used this way is based on a number of factors. Trees suitable for integration into a building need to be evaluated by an expert. A certified arborist can analyze the tree’s existing health, age and current growing conditions to determine how likely the tree is to survive the construction process. An arborist will likely need to remain involved to monitor the tree’s health on a regular basis. Utilize them for their artistic and cooling properties. Oftentimes a homeowner wants to go through the extra effort and expense to integrate an existing tree because there is something special about it. The tree could have an unusual character or form that would translate well in the home. Additionally, trees can provide substantial cost benefits. Travis Price of Travis Price Architects is experienced with integrating trees into residential buildings. He cites the value of trees for their cooling properties by saying, “Shade is the most cost-effective British thermal unit in the world.” Existing trees that are preserved and integrated into the architecture of the home can help with the summer cooling costs because the trees shade and cool the house. Know exactly where the roots are. As with any construction near existing trees, it is important to protect the root zone from damage. A general rule of thumb considers the critical root zone as determined by the tree’s trunk diameter or by the drip line measured from the trunk to where the branches extend. However, this calculation is not precise enough when building close to an existing tree. Instead, air-spade technology can blow soil away to reveal where the major roots occur. Using that information, a precise mapping of the roots can inform the exact locations of deck and foundation pilings as well as other structures. Protect the roots. It is critical that the roots are not damaged or disturbed during the home’s construction. Root injury resulting in tree mortality can occur when there is mechanical damage to the roots or when the soil surrounding the roots is compacted. In this photo, a platform foundation set on pilings allows for minimal site disturbance so that the tree roots are protected from harm. Provide water. Constructing a home around existing mature trees typically results in decreased access to normal rainfall because of a new roof, foundation or other structural piece that redirects rain away from the roots of the tree. Here, the home floats above the ground on pilings, and the tree trunks are surrounded by glass with an opening to the sky. This doesn’t provide the roots underneath the platform with much access to rainfall. Instead, a timed irrigation system waters the roots under the home to ensure that adequate water reaches the trees. Homes can be designed to have indoor planting areas for growing new trees inside. This essentially sets up a container condition because the soil is encapsulated by the building foundation. It can work beautifully so long as the tree receives the essentials: air, water, soil and sunlight. It’s also important to consider the tree’s growth habits, requirements and ongoing maintenance. Provide enough soil. The challenge with planting trees inside is the limited soil volume. A tree grown inside is essentially akin to a container plant, even in the larger sizes. The weeping fig (Ficus benjamina) pictured below is a common indoor plant—and street tree in warm climates—that can live in a relatively small soil volume. This makes it an ideal indoor tree. Also, it’s evergreen and very low-maintenance. Photo by Kuth/Ranieri Architects; original photo on Houzz. Provide steady light. Trees will grow best when provided with bright light. The light can be indirect or diffused, but it should be consistent for the tree to grow and thrive. Consistency is important because regular bright light exposure will keep the tree from growing gangly and will produce consistent foliage. [Try] a fiddleleaf fig (Ficus lyrata) growing near a large and bright expanse of windows. While not a tree, [a] clump of bamboo makes a pretty addition to a well-lit stairwell. The stones provide a nice finish on top of the soil. Interesting evergreen leaves: Pick a species that has showy or textured leaves that won’t drop all at once. The big leaves on fiddleleaf fig or Indian rubberplant (Ficus elastica) are good examples. Small stature: Choose a tree that won’t outgrow its space by knowing its mature height and spread when grown in a container. For example, the weeping fig can reach massive height and spread but will have limited stature when grown in the confines of an indoor planting. Other trees that maintain a small size in a container include Japanese maple (Acer palmatum) and Norfolk Island pine (Araucaria heterophylla). Low maintenance: Stay away from trees that produce messy fruits, or need to be constantly fertilized or pruned. Of course, you also want to be mindful of plants that have poisonous parts and opt for nontoxic ones if you have kids or pets.